The 10th record (not including two EPs, a live album and a “greatest hits” collection) from stalwart Toronto band Sloan, The Double Cross (just released on Yep Roc) also serves to commemorate the quartet’s 20th anniversary as a versatile guitar-pop collective. Guitarists Patrick Pentland and Jay Ferguson, bassist Chris Murphy and drummer Andrew Scott—all four write and sing their own tunes and often switch instruments onstage—have successfully forged a productive two-decade career full of preternaturally catchy songs and beyond-entertaining live shows. Thankfully, they don’t appear to be slowing down; The Double Cross continues the group’s winning streak, particularly the seamless opening 1-2-3 of Murphy’s “Follow The Leader,” Ferguson’s “The Answer Was You” and Pentland’s “Unkind.” (Check out the band’s YouTube channel for a track-by-track discussion of the LP.) In honor of Sloan’s milestone, we asked Pentland 10 questions via email—because we doubt he would’ve felt like answering 20. 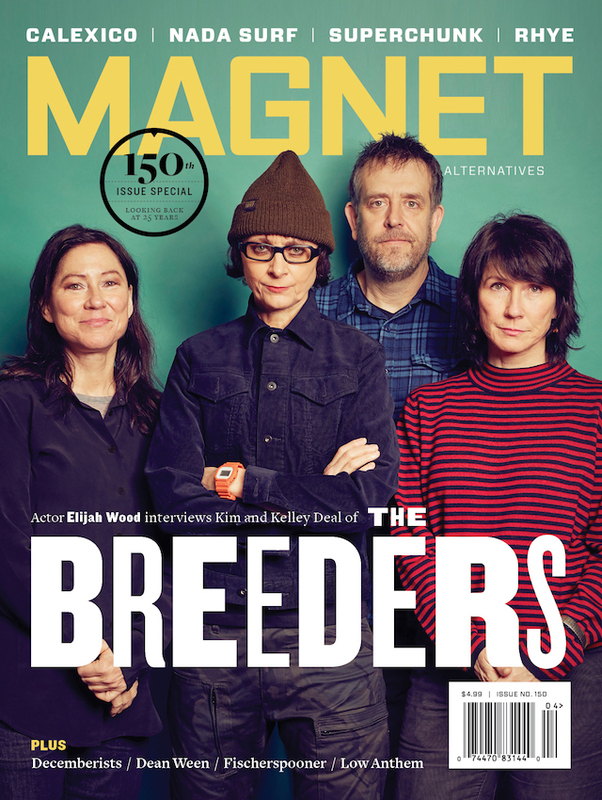 And in their typically all-for-one, one-for-all fashion, the members of Sloan are guest-editing magnetmagazine.com this week. MAGNET: When you guys started, did you have any vision at all about where you’d be in 20 years? Pentland: We thought in smaller steps at the beginning. We had played in bands for a while and knew people who had made the move out of Halifax and were in struggling, working bands. There was no thought of a fairy-tale signing, where we would some how “make it” and take the fast lane to stardom. That would have been embarrassing. We just wanted to climb the ladder keeping as much integrity as we could. It turns out that takes a long time. Has there been any point in your history where any of you, or all of you, thought you might break up and do other things? Certainly. In fact we did break up after touring our second record, (1994’s) Twice Removed, if only for a few months. We’ve spent 20 years building this thing together, so as time goes by, it’s important to keep it going. There are plenty of bands that have been around this long, although not as many with all the founding members. While you have a following here, you guys are much more popular in Canada. Give us an idea of just how well-known you are up there. We aren’t as popular as people think. We’re minor household names at best. Within the music biz, we’re well-known, we get played on the radio, and we’re able to tour and make money. When we tour, we play clubs or small theaters, depending on the town we’re in. We also play festivals during the summer, where we get a lot more people. It’s odd that we can play a club in somewhere like Calgary and have 600 people come out and sing along, and then come back in the summer and have 6,000 people come out and sing along. Some people don’t do the club scene. Twice Removed won a 1996 magazine poll as the best Canadian album ever, fell to third in the same poll in 2000, then topped it again in 2005. Why are Canadian listeners so fickle? Since we have universal healthcare, we don’t need to take life very seriously. Bands usually seem to have a single, autocratic songwriter type, or maybe even a duo that handles most of those duties. 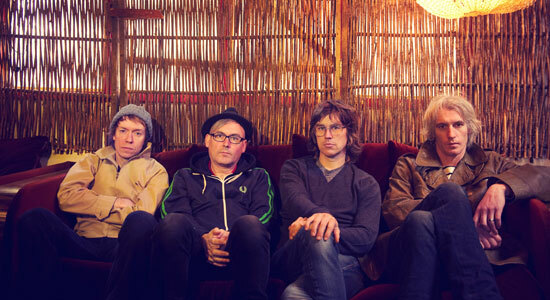 How does Sloan’s dynamic work with four guys who all write and sing? We’re all capable of writing and producing our own music, but the goal isn’t to just combine four solo albums. There’s a cohesiveness that happens somewhere towards mixing, but we like to have the personalities of the band shine through. There isn’t really a leader, although certain people rise to the top in different situations. Jay and Chris tend to work together the most, but everyone’s opinion is valid. It’s a real treat for the people who work with us—everyone’s the boss, and we all have our own opinion as to how to proceed. Surely there are times when someone’s material isn’t received as well as they hope. How often are there bruised egos? Rarely. We’re all fairly good at editing ourselves. There’s an unspoken standard that we try to live up to, and if a song isn’t cutting it, the respective writer usually knows it. Once a record is released and we start playing songs live, it becomes pretty clear which ones the audiences are into. They can be real pricks. The “power pop” label is often viewed as an albatross. How do you guys feel about getting that tag? I actually didn’t know what it meant until I finally looked it up last year. It’s a horrible term. It makes me think of Burt Bacharach or Phil Spector, nothing like what we sound like. We’re just a rock band. We come more from a punk-rock background than from the Beatles or any ’60s thing. That all developed later as we were trying to expand our influences and get away from what all the bands around us were doing in the mid-‘90s. At a show in Chicago a couple of years ago, Chris was playing drums during “Sensory Deprivation” and his glasses flew off. He kept on going, of course, but I was wondering if you guys would notice any difference in his drumming if he can’t see the kit. He can’t see the kit anyway—it’s just a blur of arms. Hairy arms. The last time you guys played in Chicago, Chris came over to our table in the bar and chatted with us for about 20 minutes. When he left he said, “Next time, bring some broads.” What is it about Sloan’s music that attracts dudes vs. women? We get a fair amount of ladies at our shows, just not in Chicago. That town’s all sausage. If we bring some broads to the next show, what’ll happen? You will be ignored. The broads will party on the bus.